From Dana Lyons: Battered broker-dealer stocks are testing a potentially key line of support. Entering 2018, one of the hottest – and one of our favorite – industries was the broker-dealer space. That mantle of relative strength was further reinforced by the group’s resilience in the post-January correction. 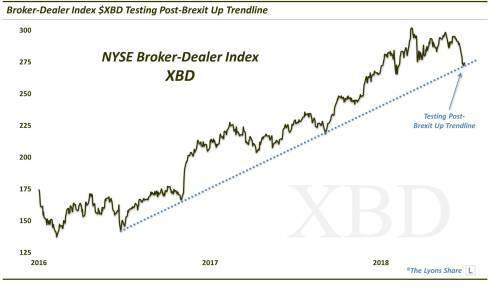 In fact, the group, as measured by the NYSE Broker-Dealer Index (XBD), was among the first to return to new highs, doing so by late February. After strong follow-through into March, however, it has been a different story. In the back half of March, the XBD saw a drawdown of nearly 10%. And a less than explosive rally back had us selling our broker-dealer position in mid-April. After some chopping around for the next month, the group was headed back lower again, undercutting those March lows in the past few days. So is there any hope for this languishing group? Well, presumably it would help if interest rates resumed their ascent that had assisted, or at least corresponded with, the late-2017/early-2018 rally in broker-dealer stocks. Of course, that is conjecture, but there is also an objective, technical basis for some optimism towards broker-dealer stocks in the near-term. As we showcased in today’s (early) edition of #TrendlineWednesday on Twitter, the XBD is presently testing a key Up trendline stemming back to its 2016 Brexit low, and connecting the election low in November 2016 and the low in September 2017. Will the line hold? Nobody knows for sure. However, it is one technical factor in favor of at least a near-term bounce in broker-dealer stocks. In a Premium Post at The Lyons Share, we take a deeper dive into the chart of the XBD as well as examining other factors to shape a more comprehensive analysis – and produce a specific game plan for the space. If you want a deeper technical read on the broker-dealer sector, and the potential opportunities therein, check out The Lyons Share. You can also follow our investment process and posture every day — including insights into what we’re looking to buy and sell and when. Thanks for reading!